(CNN) -- A Hummer used by CNN to cover the war in Iraq and then renovated on The Learning Channel netted $1.25 million for charity on Saturday. Proceeds from the sale of Warrior One, which toured military bases and medical centers nationwide before the auction, will be donated to the Fisher House Foundation. The organization temporarily houses families of patients receiving major medical care in military hospitals and Veterans Affairs facilities. "The guy that put the [$250,000] in was bidding against me to the last minute," Liniger told CNN, "and he turned around, he put his arms around me and he says, 'Hey, you buy the car, you get the car. I'll add 250 to it.' A fabulous gesture." Liniger said he visits auction house Barrett-Jackson Co. every year to add to his car collection, but said Re/Max has a new foundation, called Sentinels of Freedom, aimed at helping disabled soldiers "have a chance to go back into a normal life." "The military tries to take care of them, but once they leave (Walter) Reed ... they're on their own," Liniger said. "Some of them don't want to go anyplace. Some are highly motivated and just want to keep trying, and so for us, this is a beautiful symbol." He called Warrior One a "beautiful, beautiful vehicle" and said he had seen it several times and heard stories about the artwork featured on it. He pledged to take the Hummer "all over the United States." "It's your heart," Liniger said. "It doesn't make any difference whether you're Republican or Democrat. These are your kids." The crowd cheered as the bidding reached $1 million. Earlier, Barrett-Jackson Co. President Steve Davis had told CNN he was "optimistically thinking multiples of six figures" for the Hummer's price. H1 Hummers like Warrior One typically sold for $129,000 for an open-top model and $140,000 for a hard-top model, according to General Motors. The automobile company discontinued the model in June 2006. Saturday's auction in Scottsdale, Arizona, featured more than 1,200 automobiles. Barrett-Jackson Co. said it expected the event to attract more than 225,000 visitors. A spokesman for the Fisher House Foundation said the organization has reaped the benefits of enhanced publicity because of the foundation's connection to Warrior One and the auction. "The attention that CNN has given to the Fisher House Foundation has greatly assisted us in making the public aware of the wounded and injured service members and their families," Jim Weiskopf, a spokesman for the organization, said Friday. CNN used the Hummer in Iraq in 2003, while a news team was embedded with a Marine Corps unit. That four-man team -- and the Hummer -- came under heavy fire in April of that year, when coalition forces took Baghdad. In November 2006, the vehicle appeared on TLC's "Overhaulin' " show. Crews replaced the engine, raised the vehicle's body and airbrushed images of CNN correspondents and troops along its exterior. They also added a DVD player, four televisions and a state-of-the-art sound system. After the renovation, the Hummer toured military bases and medical centers from Texas to Washington, D.C.
CNN's Taylor Gandossy contributed to this report. 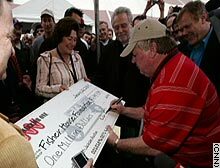 Dave Liniger, founder of Re/Max, signs a $1 million check held by his wife, Gail, for CNN's Hummer.